That feeling we all don’t want to associate with because it makes us feel empty,open and vulnerable. There is need for repairs,this attracts God to move into our life and fix our dysfunctional nature,He only can do that. 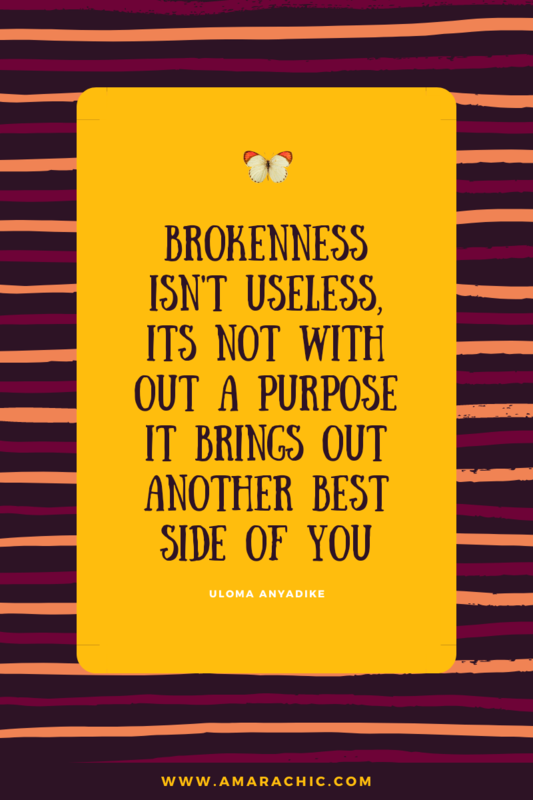 Brokenness isn’t useless, its not without a purpose it brings out another best side of you, it transforms you, permit me to be to painfully plain, yeah it brings out the sweetness in you. As tough and hard as Coconut is,it has to be broken to reveal the sweet water and sumptuous flesh likewise the egg has to be broken to be useful. I bring you Good news this beautiful morning,your brokenness (that pain, depression, pressing issue/need, thick cloud etc) is going to bring out the very best of/in you,it will launch you into you vision, destiny, ministry, God ordained relationship, next level you just name it. God isn’t done with you yet,”out of the carcass shall surely come forth sweet honey”! I Love you all, be inspired you are breaking forth!